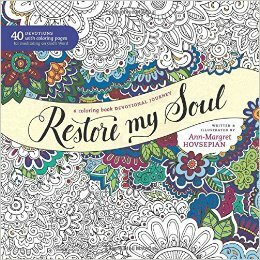 Meditate using this new coloring book by Ann-Margret Hovsepian. A couple years ago, my employer sent me to the Frankfurt Book Fair to spot trends. We want to prepare our students for what’s coming, not what’s been. Frankfurt is the largest book fair in the world, so I spent hours walking the aisles, talking to venders, and scoping out products. And I came home with a couple of coloring books for adults. I had never heard of such a thing! It was like paint by number only using colored pencils instead of paint—and without the numbers. I got to choose what colors I liked best. And sure enough, now they’re everywhere, these books. And my friend Ann-Margret Hovsepian has created a nice one especially for helping us think about what matters. She includes a devotional thought with a verse opposite each coloring page. And the pages are thick enough that I could use a small magic marker without having it bleed through. Even non-artists can pull away from the screen and create within boundaries. Check out Restore My Soul. This is THEE perfect gift in mind for someone special in my life. Thanks for sharing!